Who Built It? : In 1935, just after the Douglas Bridge was built, the US Forest Service built the Dan Moller Ski Trail to the head of Kowee Creek valley. This trail created access to meadows on the lower slopes above West Juneau. 1935 is also when the Juneau Ski Club moved their portable rope tow from the Perseverance Valley across the Douglas Bridge and set it up at 1st Meadow. A few years later the Juneau Ski Club moved this operation a little further up the Dan Moller Trail to 2nd Meadow. Lifts: In 1935 a portable rope tow (a toboggan with a motor bolted to it) was brought from Alexander "Sandy" Smith's cabin near his mining claims in the Granite Basin area east of Juneau (see Perseverance Rope Tow) to the 1st Meadow area. This rope tow had 1000 feet of 1/4 inch rope. This rope tow would service the 1st and 2nd Meadows areas until the mid 40s. After World War II Tom Stewart purchased a 1000-foot ski rope tow that off-duty soldiers had made in Seward. For $50 he got the rope tow, which included an old Dodge truck engine and wooden pulleys, and then shipped the lift to Juneau. This new rope tow was installed at the 2nd Meadow and served this area until the early 1950's. Rope tows at these two areas were operated by the Juneau Ski Club. 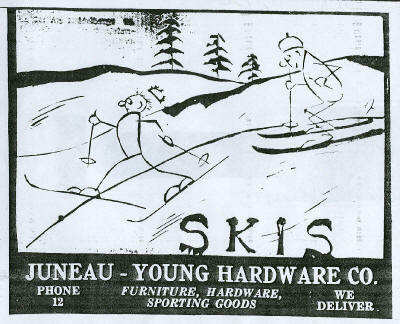 In 1951 the Juneau Ski Club moved their rope tow operation up the valley to a site knows as the Douglas Ski Bowl. 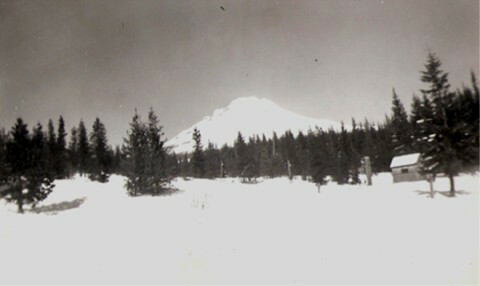 Al Shaw then started a private rope tow operation at 2nd Meadow, known as the Ka-Wa-Ee Ski Area and it operated at 2nd Meadow with improvements made on the hill until Eaglecrest opened in the winter of 1975-76. Facilities: During the Civilian Conservation Corps (CCC’s) era in the 1930's, the U.S. Forest Service supervised CCC labor to construct the first two cabins at 1st and 2nd Meadows. The construction foreman was Dan Moller. 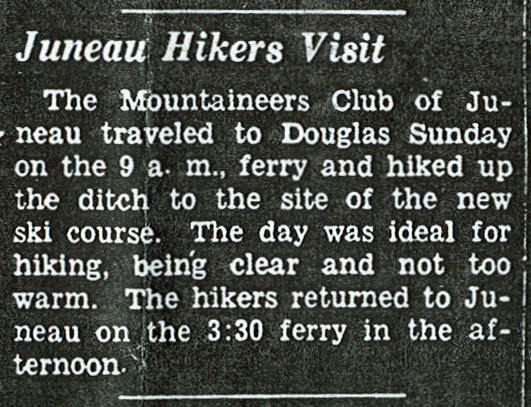 At this same time, the Dan Moller Trail was being constructed, followed by the upper cabin in the location that would eventually become the Douglas Ski Bowl. The upper cabin, or Dan Moller Cabin was also known as 3rd Cabin by the locals. 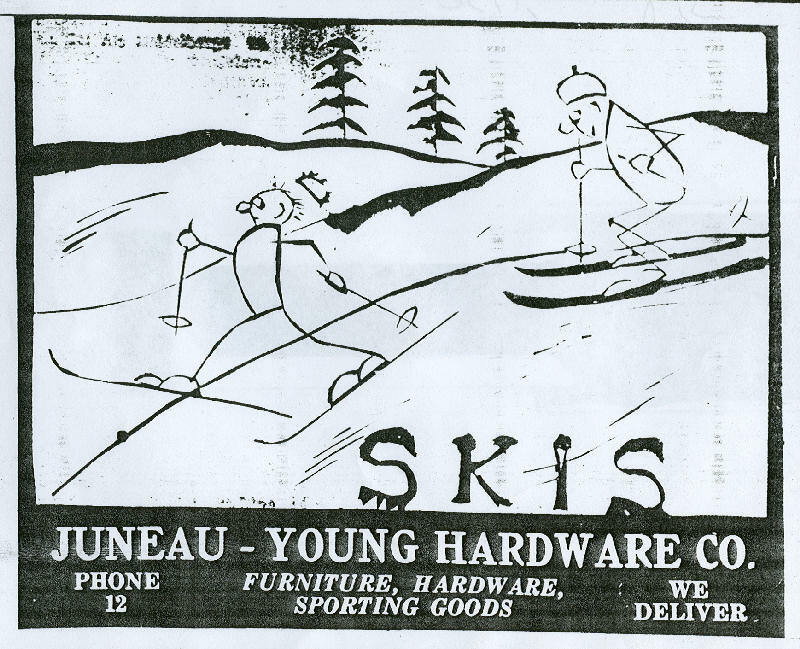 Miscellaneous: During the 1940’s through 1974, the Juneau Ski Club sponsored annual ski tournaments from the Douglas Ski Bowl down the Dan Moller Trail to the bottom of the trail in West Juneau. The Upper Cabin area was at an elevation of 2,000 feet, and the downhill race over the Dan Moller Trail had a vertical drop of 2,200 feet. In the early days (1940’s and 50’s) the annual ski tournaments included a four-way event: downhill, giant slalom, slalom, and jumping. The jumping took place at Jump Hill (also a separate web site) near the bottom of the Dan Moller Trails. Ski clubs from all over Alaska and the nearby Canadian provinces participated in the events. Also in 1935, the Douglas Bridge was built and access to meadow areas on Douglas Island opened up via the Dan Moller Trail which was constructed by the U.S. Forest Service. 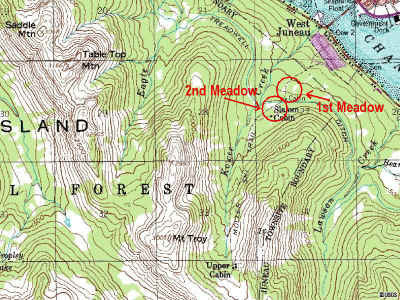 The little portable tow was moved to these sites, called 1st Meadow and 2nd Meadow, about 1 1/2 miles up the trail. Forest Service shelters were built which became 1st Cabin and 2nd Cabin. Ten years later, after returning from the U.S. 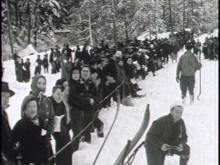 Ski Troops and the 10th Mountain Division, Judge Tom Stewart and others helped to get the Ski Club's first "heavy duty" rope tow going. This was powered by a 1945 Dodge truck engine purchased in Seward for $50, and was set up at the lower 2nd Cabin area. 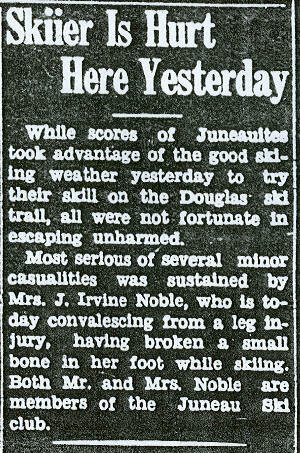 Skiing remained a minor recreational activity in Juneau until the Douglas Bridge was built in 1935, said [Tom] Stewart. The bridge and the construction of the Dan Moller Trail opened Kowee Creek Valley above West Juneau to skiing. 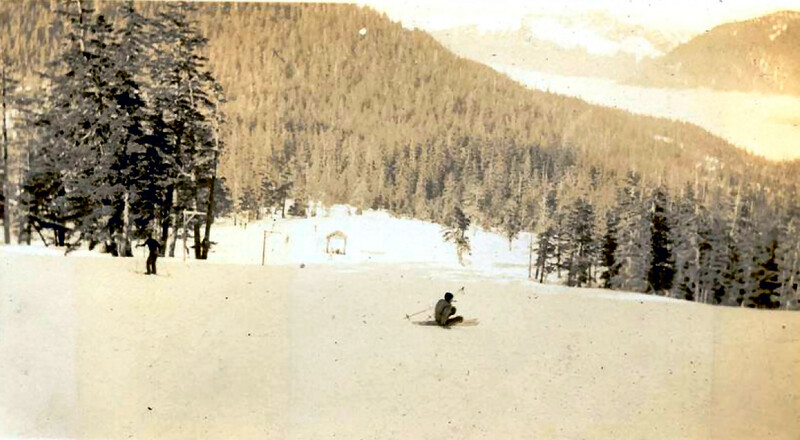 With its continuous elevation gain and open meadow areas the valley offered a number of skiing opportunities and the Perseverance rope tow was hauled up to the first meadow and installed. The Forest Service built cabins at meadow areas. A bowl-shaped basin at the end of the valley with just the right elevation for snow accumulation offered further promise for skiing. Another development that increased the popularity of skiing in Juneau was a revolutionary technique introduced by two European immigrants. Stewart said both men, one from Austria and the other from Germany, probably came to United States to escape Hitler and to Alaska to put some distance between themselves and U.S. immigration officials. 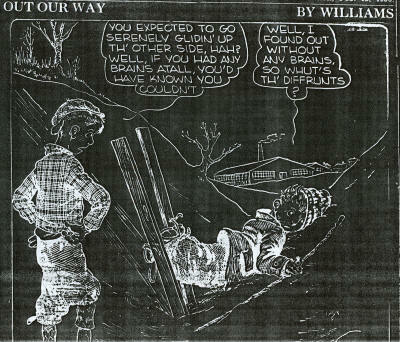 The men had been invited to Juneau by two avid Juneau skiers, Kurt Shattuck and Norman Banfield, who had met them at Sun Valley, a ski resort. 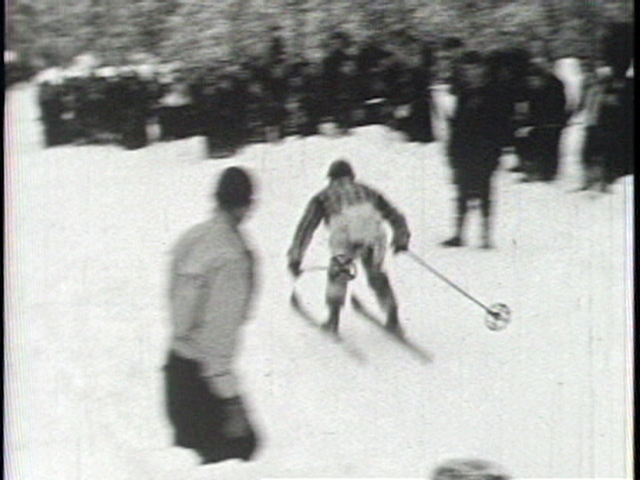 The two Europeans taught Juneau skiers the Arlberg technique, where the skier bends forward, placing the body's weight on the balls of the feet. "That's not a natural thing to do. The natural thing is to set back on your heels," Stewart said. The technique allows skiers to rotate their weight and steer the skis. Following his return to Alaska after World War II, Stewart made a trip north where he spotted a 1,000-foot ski rope tow system outside the town of Seward. Off-duty soldiers looking for something to do had put the operation together, said Stewart, who purchased it as surplus from the Army for $50 and shipped it to Juneau. In addition to the rope, the assemblage included an old Dodge truck engine and wooden pulleys. 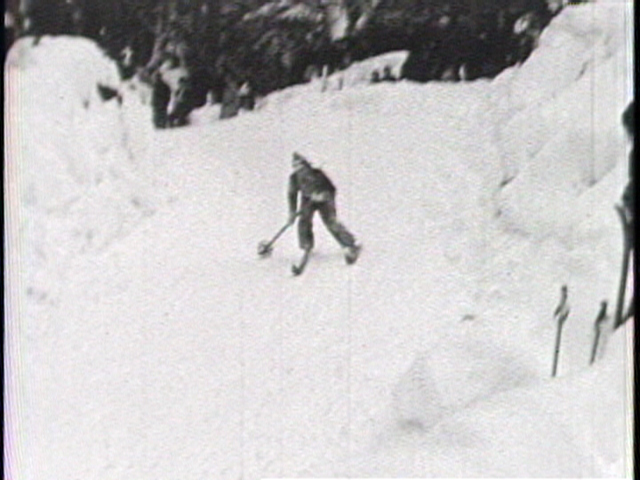 The rope tow was installed at the second meadow and became the focus of skiing in Juneau until the early 1950s, said Stewart. 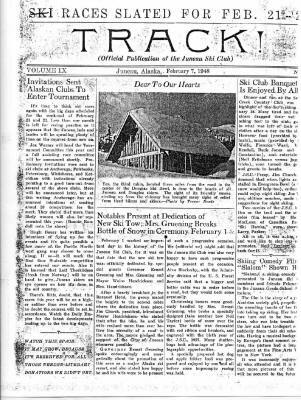 This document contains great pictures and information about the Dan Moller Cabin and skiing history of Douglas Bowl and the Moller Trail area. Click here to access this PDF document (note: size of the document is 1.6 MB). Photos: Does anyone have recent pictures of the Meadows sites or cabins near the junction of the Dan Moller and Treadwell Trench trails that they would like to contribute to ALSAP? 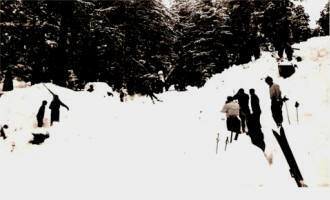 Bob Janes, ski historian of the Juneau Ski Club, coordinated the creation of these digital stills from a 16 mm black-and-white movie film that is in the JSC archives. 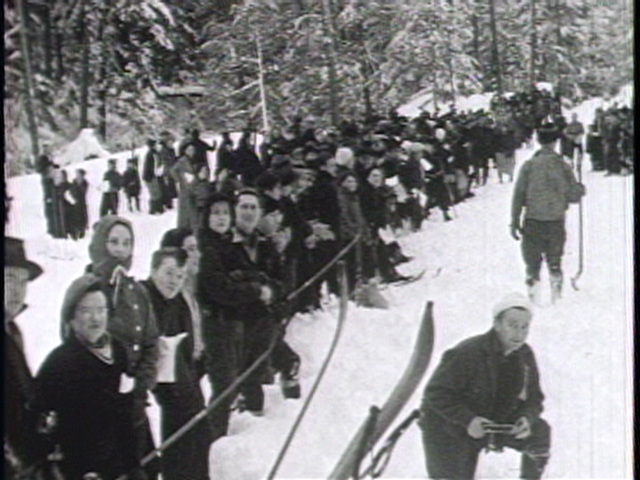 The filming was done in 1936 by the late Trevor Davis, a professional photographer in Juneau. These stills are from a film of a downhill ski race on the Dan Moller Ski Trail. Note the racer using just one pole in the leftmost picture. And the massive crowd of spectators show in the right-hand picture. Bob Janes gave ALSAP this information about Trevor Davis: "Trevor was a professional photographer in Juneau and he owned and operated a photo shop downtown for many years. 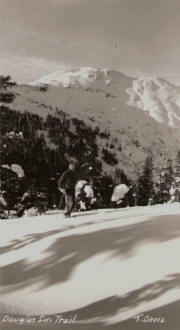 He was not a skier, but he loved to take movies of all the action on Douglas Island. He used snowshoes to hike up the Dan Moller Trail, and always had a big pack to carry (with his camera gear, tripod, etc). He was a wonderful man, and I knew him well. 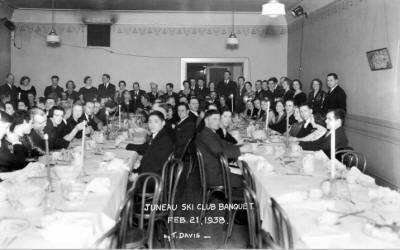 He donated all of his movie film and other photos to the Juneau Ski Club,and I have taken care of them in our archives ever since." 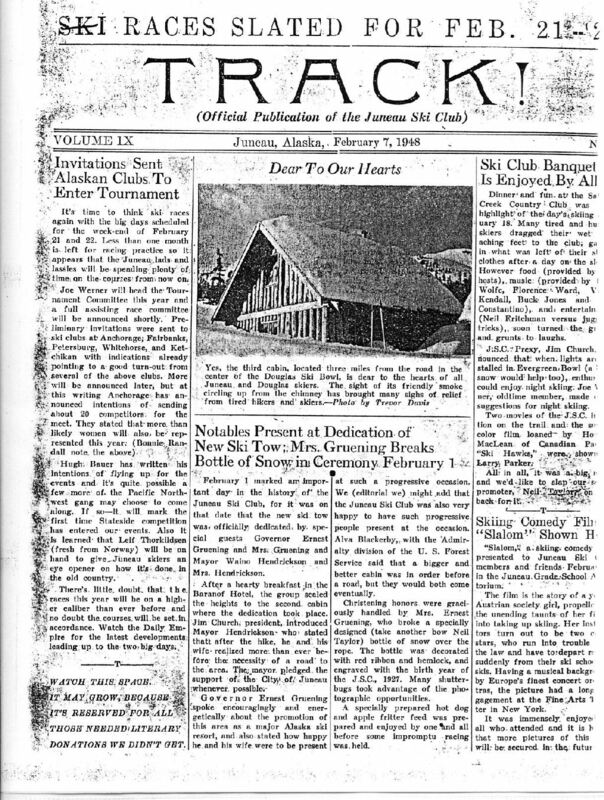 This copy of a February 7, 1948 issue of TRACK !, the Official Publication of the Juneau Ski Club mentions that Governor Ernest Gruening and his wife attended the dedication ceremony for the 2nd Meadow new ski tow. An excerpt: "Christening honors were graciously handled by Mrs. Gruening, who broke a specially designed (take another bow Neil Taylor) bottle of snow over the rope. The bottle was decorated with red ribbon and hemlock, and engraved with the birth year of the J.S.C., 1927"
The 1974 topo map to the right shows the general vicinity of where 1st Meadow and 2nd Meadow rope tows were. 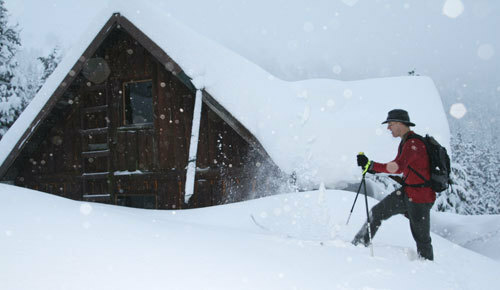 The second meadow cabin is designated by "Slalom Cabin" on the map. 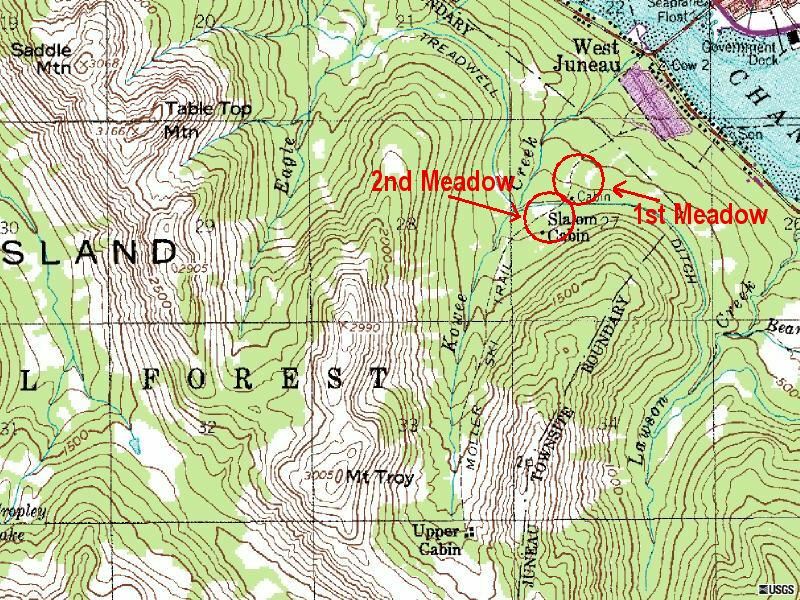 The "Upper Cabin" on the map is the Dan Moller Cabin. Name of Ski Areas: OK as is. Type of Area: Rope Tows operated by the Juneau Ski Club. Dates of Operation: 1st Meadow: From 1935 thru 1947. Moved their rope tow operation up the valley to a site known as the Douglas Ski Bowl (see the separate web write-up for this). 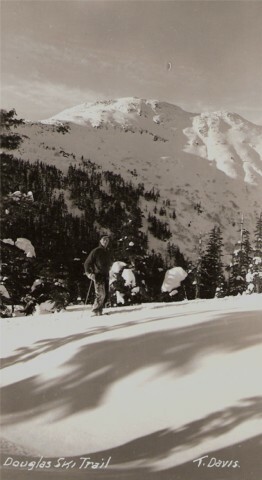 Al Shaw then started a private rope tow operation at 2nd Meadow, known as the Ka-Wa-Ee Ski Area (I need to check the accuracy of this spelling) and it operated at 2nd Meadow with improvement made on the hill until Eaglecrest opened in the winter of 1975-76. Perseverance Valley across the Douglas Bridge and set it up. At 1st Meadow. Base elevation was 400 feet; Top 500 feet. further up the Dan Moller Trail to 2nd Meadow. By 1948 they had acquired a new rope-tow (see the write-up on the Dan Moller Ski Trail web site). Then, in 1951, Al Shaw opened his new operation. The base elevation was 600 feet; top elevation 1,400; 800 vertical ( I need to double check this for accuracy). Lifts: The first two paragraphs are OK as is, except in the first paragraph say “Sandy Smith’s cabin near his mining claims in the Granite Basin area.Area. Facilities: Change to: During the Civilian Conservation Corps (CCC’s) era, the U.S. Forest Service supervised CCC labor to construct the first two cabins at 1st and 2nd Meadows. The construction foreman was Dan Moller. At this same time, the Dan Moller Trail (see separate web site) was being constructed, followed by the upper cabin in the Douglas Ski Bowl (also a separate web site) The upper cabin, or Dan Moller Cabin was also known as 3rd Cabin by the locals. Miscellaneous: During the 1940’s through 1974, the Juneau Ski Club sponsored annual ski tournaments from the Douglas Ski Bowl down the Dan Moller Trail to the bottom of the trail in West Juneau. The Upper Cabin area was at an elevation of 2.000 feet, and the downhill race over the Dan Moller Trail had a vertical drop of 2,200 feet. In the early days (1940’s and 50’s) the annual ski tournaments included a four-way event: downhill, giant slalom, slalom, and jumping. 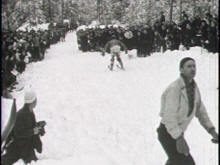 The jumping took place at Jump Hill (also a separate web site) near the bottom of the Dan Moller Trails. 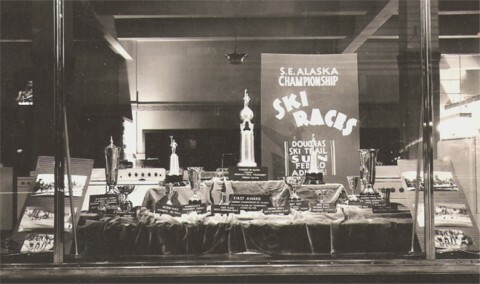 Ski clubs from all over Alaska and the nearby Canadian provinces participated in the events. The U.S. Forest Service wants to tear down and rebuild the Dan Moller cabin on Douglas Island. Built in 1936 with local logs by the Civilian Conservation Corps, the 16-foot-by-18-foot cabin is one of Juneau's best loved and most used for decades. But the Forest Service has a lot of reasons to start fresh. Most important: "It's the rot," said Ed Grossman, recreation program manager of the Forest Service Juneau Ranger District. "We're dealing with basically what is going to be a structural failure." 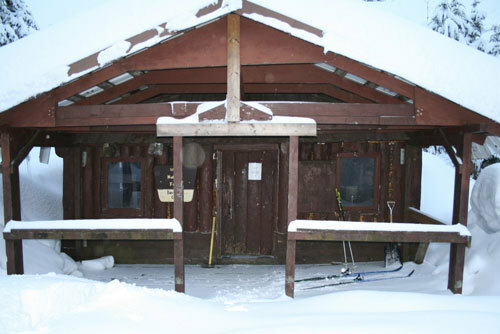 The Forest Service plans to close the cabin to the public if it isn't fixed in 2009. With the usual horizontal-log design used in these parts, when the inevitable moisture brings the inevitable rot, you can replace the lowest logs. But Dan Moller's logs run vertically. And while they've been replaced before, they're rotting again. Aside from the vertical log problem, heavy snow piles up against the walls. The melt keeps the logs wet all winter, and the weight of the snow pushes the walls off level and breaks rafters and windows. The walls are poorly insulated. Rodents run in and out. A disabled-accessible outhouse was built in 2007, but it needs a walkway. The cabin has been fixed up several times since the Forest Service acquired it in 1983. At that time, it was in bad shape. That year, Taku Conservation Society, Juneau Ski Club and Vietnam Veterans of America volunteers took out the rotted bottom sections of the vertical log walls and replaced them with creosote-treated pier pilings, and put on a new roof, floor and windows. In 1990, the cabin got a porch, and in 1999, it got a new concrete foundation, floor and other fixes. Grossman said the Forest Service recognizes the cabin's long history and is planning to put up a historical display in the rebuilt cabin. "But in our opinion, it's not worth putting huge amounts of money into something that's not well designed for the site," he said. The cabin has been on the Forest Service's capital-improvements list for some time, and now the agency says it has about $250,000 for the rebuild. That's to cover the entire project, including demolition and rebuild labor, the materials, helicopter time, landscape architecture and the special engineering necessary to prepare the bid package, Grossman said. The new cabin would be a standard Forest Service design: 16 feet by 20 feet, built of rot-resistant cedar. It would be accessible to the disabled with a walkway to the outhouse and have horizontal log walls, an insulated roof, a second-floor loft with a staircase, a porch, a second-floor deck, thermo-pane windows and two main-floor doors. It would sleep up to 12 people. The new cabin would be rotated 90 degrees partly to avoid the heavy snow loads that accumulate on the current cabin, and it would be better designed to shed snow. The Forest Service is anticipating some resistance and lots of opinions on the cabin. Mary Lou King, author of "90 Short Walks in Juneau" and a resident since 1958, said she felt strongly that the cabin should not be demolished and rebuilt. King says there aren't many examples of buildings from that era. 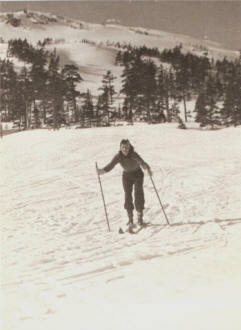 "When I first came here, that was the only ski area," said King, who warmed herself in it on many a day. "There were always people in it. Particularly people who aren't young anymore." "I think they should fix it. I really think it would be sad to tear it down," she said. Bob Janes Sr., a longtime Juneau outdoorsman, said he had a lot of good memories from the cabin, but he understood the Forest Service's need to provide public safety. Janes worked for the agency for 38 years. "Logs decay over the years," he said. "You can't expect them to be there forever. ... It'd be nice to see the same thing go back in, but is it very practical?" The Juneau Ranger District is beginning an environmental assessment of the new cabin proposal. Public comments may be submitted until Jan. 9 to Grossman at egrossman@fs.fed.us. Include suggestions, concerns and the specific rationale for the comments. "Located 3 miles up the Dan Moller Trail ... the 72 year old structure is on the verge of structural failure."